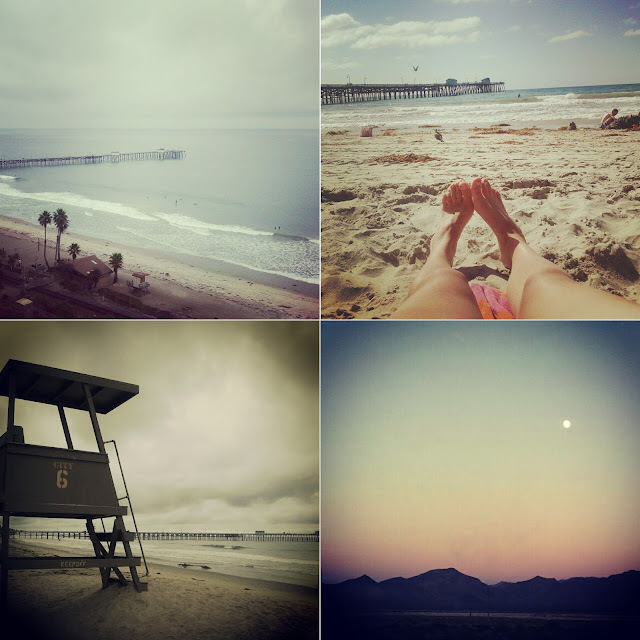 Just when the end of summer blues were taking over, we roadtripped to Southern California for some serious rest and relaxation. 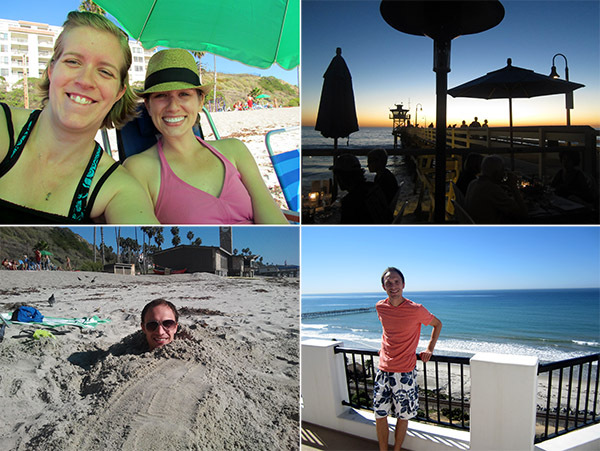 We were lucky enough to score an invite to stay with our friend Brad and Jessie in San Clemente. California did strange things to me. I woke up the first morning with the foreign feeling to go for a run. It was strange, but I liked it. And did it almost every morning that we were there. Add in a killer view from our balcony and listening to the crash of the waves while we slept and I was in heaven. Sunday afternoon we spent with Jacob's cousin Kira in San Diego. 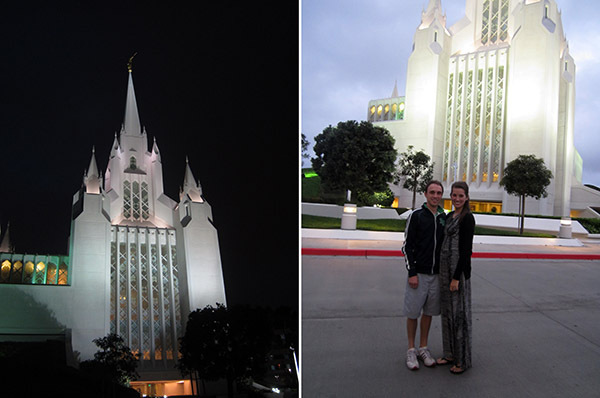 After a great picnic and tour of the Mormon Battalion, we visited the beautiful San Diego Temple. Gorgeous. Kira- it was wonderful to see you. And you make a delicious picnic. Most days were spent blissfully relaxing by the beach, building sand castles, boogie boarding and burying Jacob in the sand. 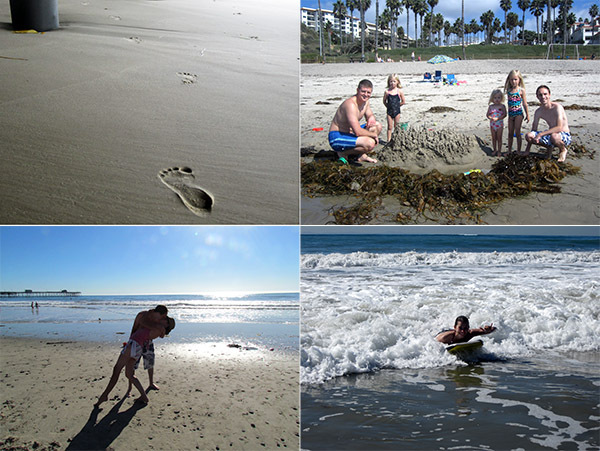 We stepped away from the beach for a day to play in L.A. 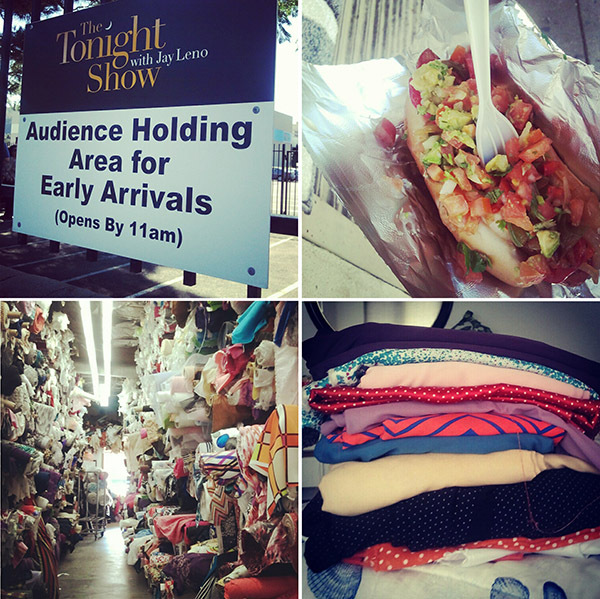 I was dying to visit the Fashion District to score some fabric. I reached out to a Merrick from Merick's Art for some advice. 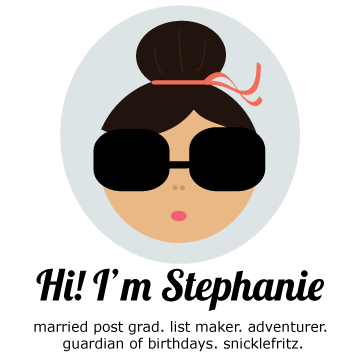 I have never emailed a blogger before and she was so nice and incredibly helpful. There are nice people in the world. I scored incredible fabric, most under $3/yard. Now I have to magically learn to sew everything that I want to make. Anywho, here is what I learned from our day at the Fashion District. Go early and during the week. It can get hot and crowded. Bring cash. A lot of the smaller stores only take cash, so be prepared with small bills. Be prepared to be completely overwhelmed by the selection. I made a list of a bunch of things I wanted to make and the yardage on one piece of paper to help me stay on track. We visited: L.A. Alex (inexpensive, but good quality fabric), Michael Levine Loft (fabric sold by the pound- by the pound!) and the FIDM Scholarship store (great knits for $1/yard). Prepare to pay for parking. It is in downtown L.A. We parked on a rooftop for $5 for the whole day. Our fun in L.A. didn't stop there. I really wanted to be in a studio audience so we grabbed free tickets to the Tonight Show with Jay Leno with Denzel Washington as the guest. (He is so handsome and charming in real life.) We were lucky enough to score front row seats, so when he comes out at the beginning we were the ones who rushed the stage. I shook his hand and Jacob high-fived him. I was enthralled the entire time. Such a fun process to watch. Go early-ish. The studio gives out more tickets than seats to ensure a full house. Our tickets said to arrive no later than 2:30, so we came at 1:30 and were 80th in line. If a heavy hitter (Justin Bieber or another teen flavor of the week) was on schedule, I'm sure you would have to be there earlier. Dress nice. 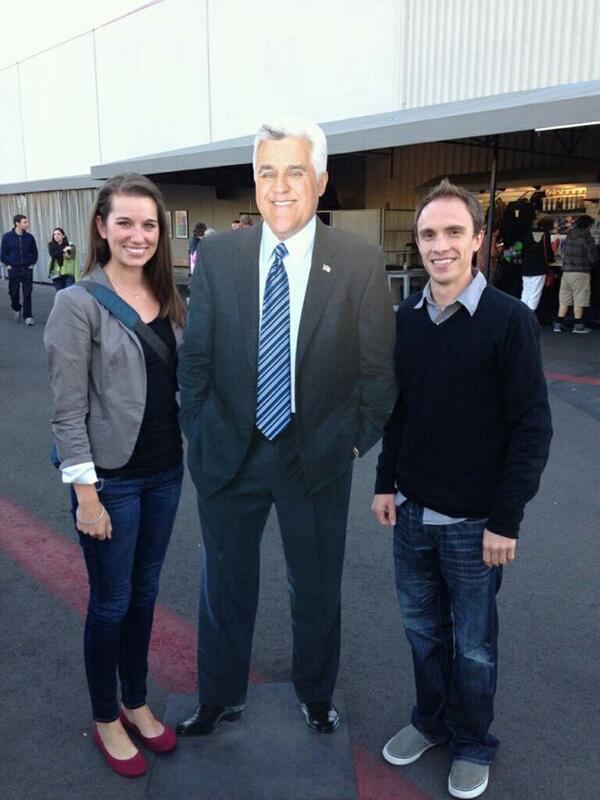 The head NBC page (sadly, it was not a west-coast version of Kenneth) seats you according to appearance. Meaning, if you dress nice/look young, etc. you will have a better chance sitting in the front. It is not first come, first serve. But you still must be on time. Bring a jacket. The studio is kept at a cool 60 degrees. Brrrr. Take a mental picture of Jay in a full-on denim when he comes out to greet the audience before the show. It is so classic. If Jay asks if anyone from the audience has a question, raise your hand so fast and ask if you can have a picture with him. He will do about 3-4 beforehand. Also, make sure to grab an L.A. dog- a hot dog wrapped in bacon topped with sauteed onions and peppers, guacamole and pico de gallo. Wowzers. After L.A. we still had a few days to play on the beach with completely marvelous weather. 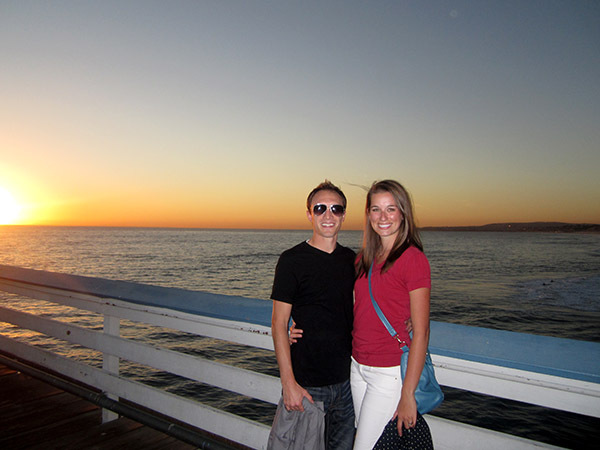 We finished up the week with a sunset dinner at the pier (all while sporting our hard-earned tans). Thank you, Ellertsons! The week was absolutely fantastic. Happy to be friends with you!